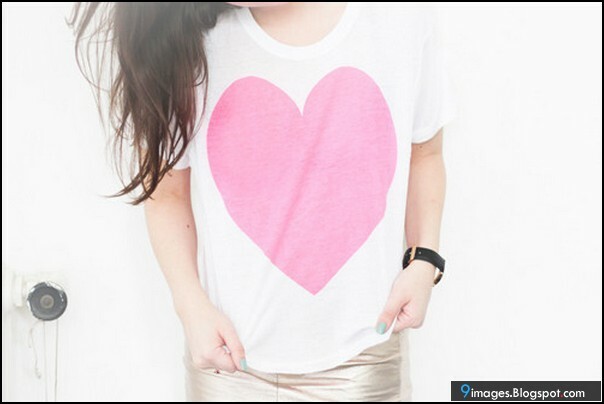 i then put on the white t and held up the heart to see where i wanted it to lay. good thing too, because if i had placed the heart where i originally had it(just sitting on the table laying on my tummy region, it'd look funny. i put in a few pins and then took off the t. i was planning on just sewing the heart on, but then remembered this awesome stuff called "liquid stitch". it's an iron-on adhesive. that's what i used. it is the bomb.com in my opinion. in my "non-sewing" days (bahaha) i would have married that stuff, and wish i would have realized how awesome it was sooner. like say, especially for some baby onesies. just for fun i stitched around the heart. basically for looks. nothing fancy or hard, but i do like the added "security" that the thread adds. it feels more permanent. *have you used Liquid Stitch before?